The 2-zone LEC is the latest addition to the family of LEC controllers, which are available for applications for up to 24 zones of control. 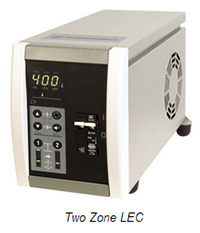 The LEC provides molders with full-featured hot runner temperature control at an extremely competitive price. Designed for smaller hot runner system applications, the LEC is offered with 2, 6 and 12 zone enclosures. The LEC features a modular design for simple control card removal, addition or replacement. Flexibility has been built-in to the LEC line for global use. It is designed to work with most hot runner molds operating in the world today. All LEC controllers are backed by a complete two year warranty and supported by the worldwide Gammaflux service and support network. They can be ordered through Gammaflux sales representatives or online at www.gammaflux.com. The Gammaflux web site has been updated to allow users to completely configure a standard or custom system for easy, immediate ordering capability. "We see the LEC as a true breakthrough in hot runner controller performance and affordability," said Mike Brostedt, Gammaflux Director of Market Development. "It provides field-proven Gammaflux quality and reliability at a much lower price. No longer do molders have to pay a high price to get high quality hot runner temperature control."